You can grant life-changing wishes for children with critical illnesses by joining Make-A-Wish® Wisconsin’s Young Wishmakers of Wisconsin. We’re seeking dynamic young professionals with diverse interests, backgrounds and professions who are passionate about being active and philanthropic members of their community. Come for the Connection. Stay for the Cause. If you would like to join, just fill out the Young Wishmakers of Wisconsin Online Form or download the YWOW Application and return it to Andrea Hug. If you or someone you know would be a good fit for this program, please contact Andrea Hug at 414.763.0472 or nuht@jvfpbafva.jvfu.bet for more information or to make a referral. Wear White for Wishes - Click here to view all the photos from this fantastic evening that was held September 7. 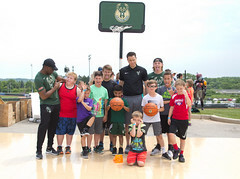 Big Bash for Kids - Click on the picture below to view all the photos from this fun family event which was held on Saturday, June 16.